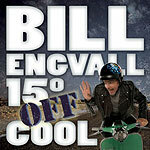 CD review: "15° Off Cool"
Comedian Bill Engvall manages to stay fresh  and very funny  by maintaining a sense of wonder toward life. His stories (they're much longer and deeper than jokes) poke gentle fun at life's travails, including the people who drive him (and us) nuts. His new CD, taped in front of an appreciative Austin audience, finds the Blue Collar Comedy Tour star running through a familiar litanies of domestic bewilderment: the relationships between husband and wvies, doing household chores, getting older. His Texas drawl intact despite years living in Southern California, Engvall has gotten away from his initial shtick of "Here's your sign" (a phrase heard not even once on the new album), and has perfected the easy-going charm of a friend sitting around with his pals swapping stories over a couple of beers. There are some truly hilarious moments on the new album (from a bit about the Ionic Breeze air fresheners to free range chickens), but the highlight has to be the closing story about his celebrity ride in an Air Force F-16.